Message It's a matter of great privilege and pleasure for me to invite you to the campus of Pranveer Singh Institute of Technology. As it is known, PSIT is a well known institute in Uttar Pradesh and every year the maximum number of AKTU toppers are PSITians. I feel proud to share that in a short span of seven years, our alumni are placed with some of the top companies or enrolled with some of the universities and research centers. At our campus, we don't only pay attention towards making our students technically sound, but we also lay emphasis on giving them the right skill sets to make them industry ready and develop employability quotient in them. This is done by preparing them on technical aptitude, communication skills and personality development round the year. I take this opportunity to thank Infosys and all the recruiters, who have our students working with them. Hope to have a long and valued association. At the same time,I would like to extend an invitation to other recruiters as well so as to give our fresh students a chance to work with them. I personally thank Chairman Sir, My Colleagues and CR Team for their co-operation. Shefali has been active in the field of education for 23 years now. She has handled leadership roles for her own venture 'SPEAKWEL' and 'PSIT'. Experiencing organizational journey during different phases such as start-up, scaling up and transformations driven through changes in education strategy, has provided her some of the most diverse and complex challenges and learning as an educationist. She is invited to reputed Organizations and industrial houses like PepsiCo, Pantaloons, HBTI, Kanpur University, Institute of Chartered accountants & IRDT. The most recent stint is the session she imparted to Senior Officials of Kanpur Municipal Corporation on Life Skills and Leadership Development. 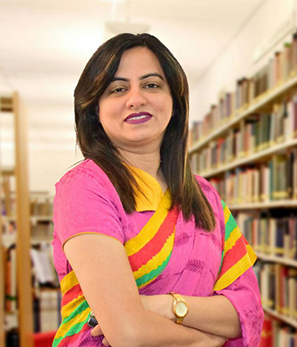 Shefali had been associated with PSIT Group of Colleges for over 7 years and has been instrumental in transforming the Brand Image of the organization. She has been able to position the college amongst Corporates as an institution of Choice and amongst parents-students as a place for great learning. PSIT today can take pride in the fact that it has produced successful professionals who are recruited by Top Corporates and PSUs. In her role as MD, she has built domain expertise in different areas of HR like Workforce Planning & Recruitment, Placements, Training, Corporate Relations, Organization Development, Employee Relations and Communications. She has impacted over 200,000 students over her 23 year journey and brought Kanpur on the India Corporate Education Map. A strong individual who balanced her passion with profession ushered to learn guitar, drive and play basketball. She never shies from singing and playing guitar on stage. A staunch believer in analytics coupled with passion drives her in her quest for excellence in all her endeavors in the field of Education and Social Service.